Email is the most valuable tool for any content marketer – and our research proves it. 93% of B2B marketers use email to distribute content, and of those, 91% consider email to be critical. Email can do so much to help you build better relationships with your audience, understand individuals’ behaviors, and even maximize the reach of your paid social content. That was the wisdom from Mathew Sweezey, principal of marketing insights at Salesforce and author of Marketing Automation for Dummies, in his Content Marketing World 2016 presentation, How to Improve the Value of Your Email Through Marketing Automation. His tips on how to leverage email in today’s world for better content marketing range from subject lines to email “plays” and why it’s more important than ever to obtain people’s email addresses. Think about how you peruse your inbox in the morning. Do you open the first email, decide if it’s good content, and move on to the next? Or do you delete all the worthless emails and read what remains? Chances are it’s the latter. That’s why your subject line and sender “are the only pieces of information to determine if email is credible,” Mathew says. Stage one: This audience is asking generic questions. They may not even know the keywords in that space. If they see a vendor’s name in the prime email real estate, they know the email is from a marketer. In the prime email real estate, don’t include keywords or brand names. Stage two: This audience is looking for social proof to support their research. Use the subject line to give them ammunition to get support from others. 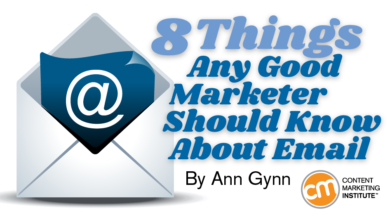 In the prime email real estate, use a keyword or brand name, but not both. Stage three: This audience wants to know they have researched all their options before they make a decision. In the prime real estate, use a keyword and brand name. One-third of marketers take seven weeks to create a piece of content; 42% take two to five weeks. You can’t craft emails the same way. Identify brief content already created that can be shared through email. Mathew shares what he learned working with MIT’s Sloan School of Management to identify the behavior of people signing up for MBA programs. The research showed that MBA candidates evaluating which schools to apply to value things outside of the actual degree, such as the connection with professors. While the example above demonstrates the ability to quickly create an email with value, it also exemplifies the real value in communicating the same way a person would email a friend or colleague. It’s authentic and personal. “Our job is not to be pretty. It’s to be effective,” Mathew says. He explains that HTML-pretty emails are holdovers from the world of direct mail – they aren’t a marker of legitimacy but a marker of marketing. 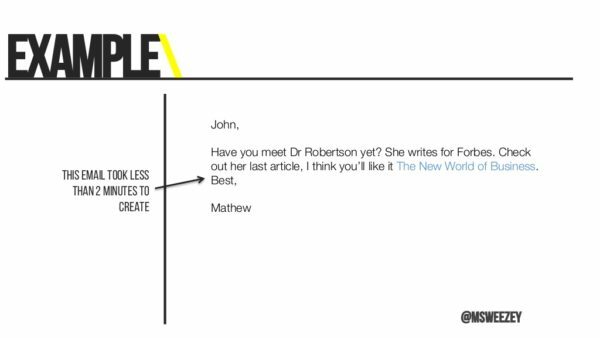 Rich text is how humans write emails. A large U.S. bank that Mathew works with tested the difference between HTML and rich text. It sent the same email using the two formats. Engagement, as measured in open rates, was four times greater for the rich-text format emails. Mathew offers a scenario familiar to many in business. You go into the boss’ office to share an idea. The boss says no. A few weeks later, the boss comes back with a “new” idea – the same one you suggested a few weeks earlier. Your boss now trusts the idea because it is his or hers. Your prospects are like that boss. You can’t just send them a series of six emails after they download a white paper and expect them to buy. You have to let them come to the answers on their own. Your job is to nurture them to ask the next question. Companies using lead nurturing the right way find they close deals 34% faster, according to Salesforce research. So how do you do that in an email? Include a secondary call to action in your email. 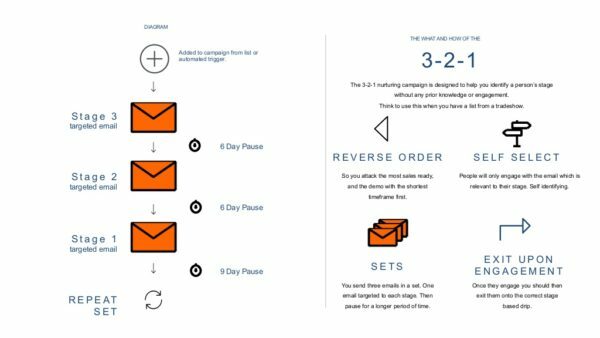 Then the recipients select what content they prefer – and that tells you if they are still in the second stage, for example, or if they’ve moved onto the third stage. 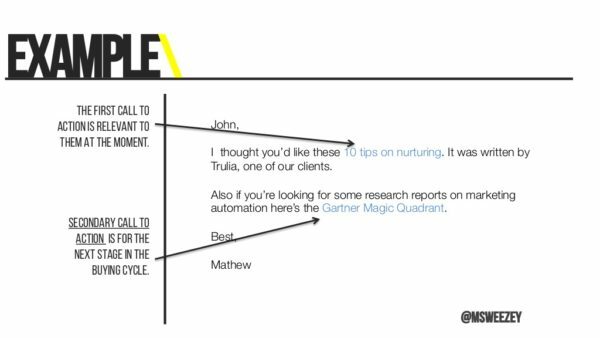 But, Mathew cautions, that only works if your content is tailored to the buyer stages. A PGA golfer has 14 clubs in his or her bag. The professional golfer must pick the best tool based on the setting of each ball and the situation of the overall game. Like a golfer, marketers also have a limited number of tools to use to accomplish infinite scenarios at high efficiency. That’s why your email nurturing plays should be limited and able to be recombined to accomplish different scenarios. Assume all recipients are in stage three. Because anyone actually in this stage is closest to a sale, it’s important to deliver to this group first. If recipients don’t respond, presume them to be in stage two. Email stage two relevant content. If they don’t respond to stage two, assume they’re in stage one. Email stage one relevant content. Repeat this cycle three times – when you send an email the recipient finds useful, she or he will select the content, letting you know where that person is in the buying cycle. Mathew worked with eCornell on a 3-2-1 email campaign based on paid search leads. The close rate was 50% and engagement was 16 times higher than non-nurtured prospects. Your company likely has a process to onboard new employees. Do you have one to onboard new subscribers? Or do you just email them the next blog post that you send everybody else? Remember, your next blog post likely isn’t your best one. Instead, the first five emails your new subscribers should receive are the five best blog posts you’ve written. Then, you can start sending them the standard email. Salesforce research reveals that 50% of high-performing marketers use email onboarding, while less than 1% of underperforming marketers do. It’s the halo effect. “First impressions matter. Every interaction is shaded by that initial impression,” Mathew says. Consider the case of Volvo Construction, which Mathew shares. Its dealers sold $100 million worth of new and used equipment in a year through Facebook. The social media platform is its No. 1 one lead driver. Now how can a big B2B company use Facebook to make those sales? Email addresses. It uploads its email lists to Facebook and Facebook can match the ads directly to those individuals. So the Volvo database can see the content by email and by social. Plus, Facebook can target people who “look” just like the profiles of those direct-match users. Volvo saw overall engagement increase by 22% when recipients received an email from Volvo and saw a Facebook ad from the company – far better than any single communication. “You’re not just sending an email but you can target that person on any channel,” Mathew says. Mathew also says the future of omnichannel marketing is the email address. Hashing technology now enables you to track the behavior of an email address online across multiple devices. Cookie technology can’t do that. You can learn when the person last visited your website, the point at which they stopped watching a video, etc., and all those behaviors can be assessed in your marketing automation platform to deliver the next email with the most relevant content. By getting more behavioral data – beyond the open and click rate – you gain the context necessary to create better content for communication and more targeted content to drive a conversion. Email is best when it’s human – we want relationships with people, not machines. HTML is not a best-in-class email format anymore – rich text emails receive better engagement rates. Email + social media = content marketing powerhouse. Remember, growing your subscriber base is not about boosting your numbers for the next e-blast. It’s about using that email address to deliver more relevant content when the recipient wants it. Want to learn firsthand from great experts in content marketing? Make plans today to attend Content Marketing World 2017, Sept. 5-8, in Cleveland, Ohio. Use code BLOG100 to save $100.